After September 11, 2001 I began to travel constantly in support of our nation's defenders and veterans. Whether by plane, train or bus, I have traveled the world visiting our troops and entertaining with my Lt. Dan Band. As Americans, we all share the pride of knowing our manufacturing and ingenuity helped make world travel possible. Plane engines and car frames produced by The Greatest Generation are among the most iconic images of American industry. The field of manufacturing has changed drastically since our grandfathers' era. Today, 3D printers are creating life changing prosthetics. Computer-controlled milling machines can produce everything from dental fillings to musical instruments. Walk into a TechShop and anything that can be dreamed can be realized through 3D scanners and laser cutters. Modern manufacturing requires highly skilled workers. More and more companies are having difficulty filling these positions with qualified employees. Meanwhile, we have servicemen and women from the most well-trained, best prepared and technically advanced military the world has ever seen unexpectedly facing life after the uniform. With the military downsizing, in the coming years more of our nation's bravest will be looking for a job in the civilian world. That's where the Get Skills to Work coalition comes in. Our veterans are perfect candidates for these high-paying manufacturing jobs. All across the nation, community colleges and companies are coming together to get American veterans educated in advanced manufacturing and hired onto shop floors. It's been my privilege to extend the thanks of our nation to thousands of veterans, young and old. In turn, even after 20 years, I am humbled each time I am thanked by a service member for my portrayal of Lt. Dan Taylor in Forrest Gump. Lt. Dan offered Americans a rarely seen perspective on veterans. With a little help from his friend Forrest, he managed to overcome his life challenges, secure a new career and thrive in life as a civilian. While most veterans transition back to civilian life successfully, many still struggle. Securing steady employment in a rewarding, lucrative and long-term career is an enormous part of that transition. Get Skills to Work is fulfilling an essential need not only for our manufacturing sector but for the livelihood and wellbeing of our nation's heroes and their families. I am so proud to be a part of this coalition and its important mission. As citizens, I believe it is our duty to ensure the defenders of our nation get the support they need before, during and after their service. We can all take a cue from Forrest and extend our hand to these heroes. It's the least we can do for the sacrifices they've made on our behalf. 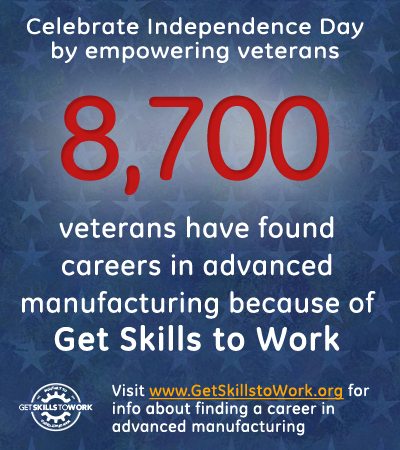 Learn more about how veterans can enter manufacturing careers at www.GetSkillstoWork.org.